FlightLevel390 has Vanished! Hello, Dave? American Digest: “Flight Level 390 and Captain Dave: Status” – he may be back! Airliners.net: “Anyone know what happened to FlightLevel390”? PPruNe: Who is behind Flight Level 390? The Disappearance of FlightLevel390 – The Greatest Mystery Since ‘Who Shot Mr Burns’? This is turning out to be a big Internet mystery – and there aren’t too many of those around these days. To avid fans of the blog, Dave dropped enough hints to let us know he flew for Phoenix, Arizona-based US Airways. He was also type rated and current on the Airbus A32x family (A319, A320, A321). 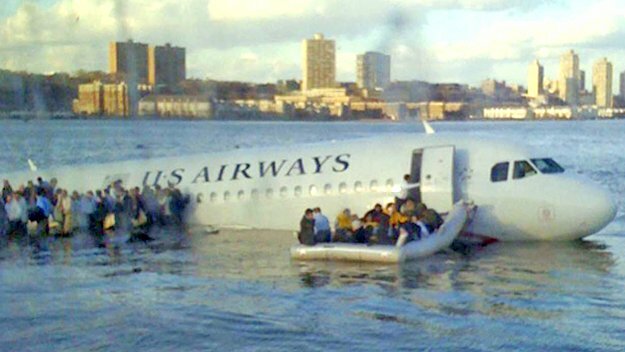 So when Captain Chesley B. Sullenberger III decided to land his US Airways A320 on a particularly wet runway in New York in January 2009, many of us faithful readers suspected our beloved Cap’n might have been at the controls. Once you start considering the reasons why someone would pull their highly successful, 5 year old blog from the Interwebz, you quickly need to ask the question: Did US Airways make him do it? Really hope Captain Dave from flightlevel390.blogspot.com is OK, his 5yo blog has vanished… and that @usairways aren’t to blame, he was PR Gold! I really hope not. Hopefully US Airways could see that Dave really was nothing less than Public Relations GOLD for the company. In the same way that “Blogger Bob” Burns at the Transportation Safety Administration Blog has become a friendly face of that fondle-happy government organisation. Come back, Dave! We miss you!! !